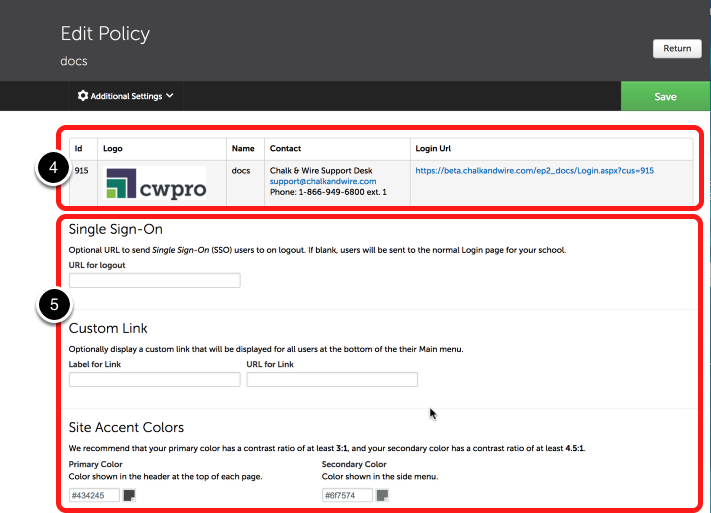 The Site Settings screen allows Administrators to manage the preferences and policies tied to their Chalk & Wire website. 1. Click the Main Menu icon. 4. At the top of the Site Settings screen you can view your Chalk & Wire site's customer ID number, domain name, current local support contact information and login URL. Single Sign-On Logout URL: Optional URL to send Single Sign-On (SSO) users to on logout. If blank, users will be sent to the normal Login page for your school. Custom Link: Optionally display a custom link that will be displayed for all users at the bottom of the their Main menu. Site Accent Colors: Choose the colors that will be used for the banners and menus in your Chalk & Wire site. Time Zone: If you are not in the Eastern Time Zone, you can select the appropriate one here. System Theme Visibility: Click to view the various Portfolio themes available to users in your site. 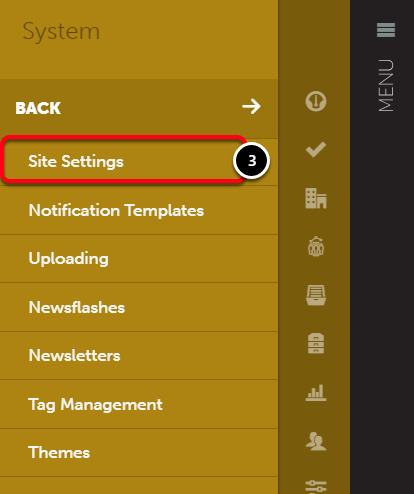 You can disable themes by clicking on them. None: if selected, your CWPro site will not use any plagiarism detection method. Turnitin Plagiarism Detection: If selected, a Turnitin Originality Report will be available to users. A separate Turnitin account is required to use this method. If enabled, the user's name, User ID and document will be shared with Turnitin. Unicheck Plagiarism Detection: If selected, a Unicheck Plagiarism Checker is available to users. A separate Unicheck account is required to use this method. If enabled, the user's document will be shared with Unicheck. Digest Settings: Click to set the time at which Digests (for favorited pages and/or threads) are sent to users. Site Contact Information: The contact information will appear on your institution's login screen, as well as in the bottom, left corner of every screen within your Chalk & Wire site. It will serve as a means for students to contact local support at your institution. You can add a primary and secondary contact name, phone number, and email address. Read each policy's options carefully before making a selection. If no selection is made, the default will be applied. Default options have "(Default)" written next to them. Advisor Groups: Choose whether or not to enable Advisor Groups. Advisor Groups enable faculty members to see results of students from other assessors. 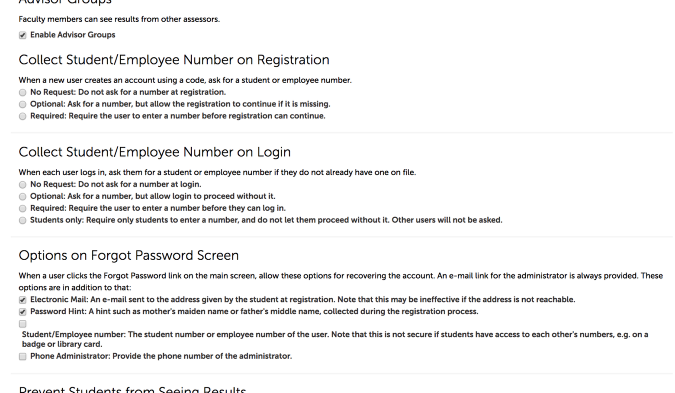 Collect Student/Employee Number on Login: When each user logs in, ask them for a student or employee number if they do not already have one on file. If your institution is using integration, the student/employee numbers will have already been recorded. Student/Employee number: The student number or employee number of the user. Note that this is not a secure option if students have access to each other's number. Phone Administrator: Provide the phone number of the administrator. Prevent Students from Seeing Results: If activated, this policy prevents all students from seeing the results of assessments. Prevent E-mail to Assessors: If activated, this policy prevents e-mail from being sent to assessors when students submit work. Reliability - Analyze Assessor Performance: If activated, this feature grants access to the "Reliability" option to Administrators in the "Assessment" menu. This allows for inter-rater testing. Multiple Simultaneous Submissions: If activated, where multiple rubrics apply to a single Portfolio page, students may submit more than one at the same time. Inactivity Timeout: If activated, the default inactivity timeout of 15 minutes will be extended to 30, 60, or 90 minutes. Collect Password Hint Question/Phone Number on Login: When each user logs in, ask them for a Collect Password hint question and Phone number if they do not already have one on file. Prevent E-mail to Student: If activated, this policy prevents e-mail from being sent to students when assessors assess the work. Assessor Demographic Surveys: If activated, pending demographic surveys are presented to assessors before assessment. Register Option on Login: Determines whether the 'Registration' link on Login is visible to users. Single Portfolio For Single Sign-On: When logging in via BlackBoard, only one portfolio will be created per toc, otherwise a new portfolio will be created for every course. "What's New" Tour on Login: Provides users with a tour outlining recent changes upon first login after site changes/upgrades. Enable Inline Document Annotation: Box is our in-browser document viewer. If enabled, Assessors and Administrators will be able to open/view documents in their browser instead of downloading them to their hard drives. 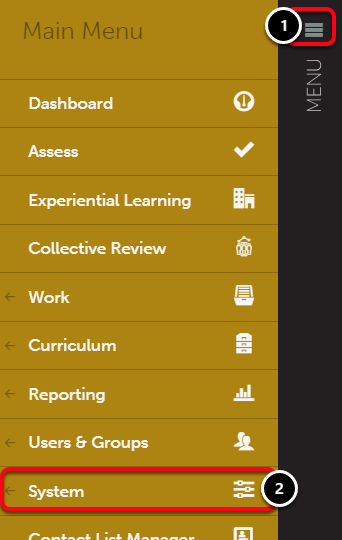 Assessment Activity Timer: If activated, time spent assessing submissions is tracked and reportable by administrators. Please visit our Run an Assessment Time Report page for information on reporting on this policy. Assessment Reference Score: If activated, assessor can see previous score on same instrument by same or any assessor. Previous scores will also be available by hovering over the criterion-specific comment box. Previous "overall" comments will not be available. Assessment Comment Suggestions: Assessors will be prompted with suggested comments during assessment. Suggestions will be based on prior comments from the same, or from all Assessors, depending on the policie selection. Automatically Suggest Grade: If enabled, a grade for the linked LMS assignment will be automatically calculated and provided to the Assessor. The grade is editable and can be changed prior to pushing the grade back to the LMS. Results Live 'Assessor' Feature: If enabled, Administrators can filter their Results Live reports by Assessors. Student Anonymity Mode: Choose how students, when anonymous, will appear. They can appear with an "Anonymous" tag or as an ID number. Bulk File Assessments: Optionally enable the Bulk File Assessments feature. This feature requires a unique code type. Learn more by visiting our Bulk File Assessments help pages. Prevent Email to Students for Assignments: When an Assignment is sent, students will (by default) not receive an e-mail notification from the system. This option is suggested if your institution has generated LTI links in your Learning Management System to Assignments in Chalk & Wire. Portfolio Sharing for edTPA Portfolios: If disabled, students will have access to the "Sharing" feature and will be able to share their edTPA portfolios. If any changes have been made, click Save at the top of the screen.